Despite enjoying a day of sunning himself on the back of my kayak while I paddle along, or sitting on my lap in a rented boat, Toby hates going in the water. You would think he was part cat the way he won’t go near it. I have tried everything — favorite toys, going in the water with him, having another dog there who he’s playing with run in the water. Once, he went near where the water touched the beach and within seconds he ran back to me. I had all but given up until last weekend, when on our way to Schroon Lake, I decided to stop in a local store and see if they had a dog toy. They did. A giant blue bone shaped toy that floated and cost me $5. It was hot, and I knew if Toby would actually just go in the water it would cool him off. When Toby saw the toy as I got out of the car at the lake he went nuts whining and crying and wanting to play. 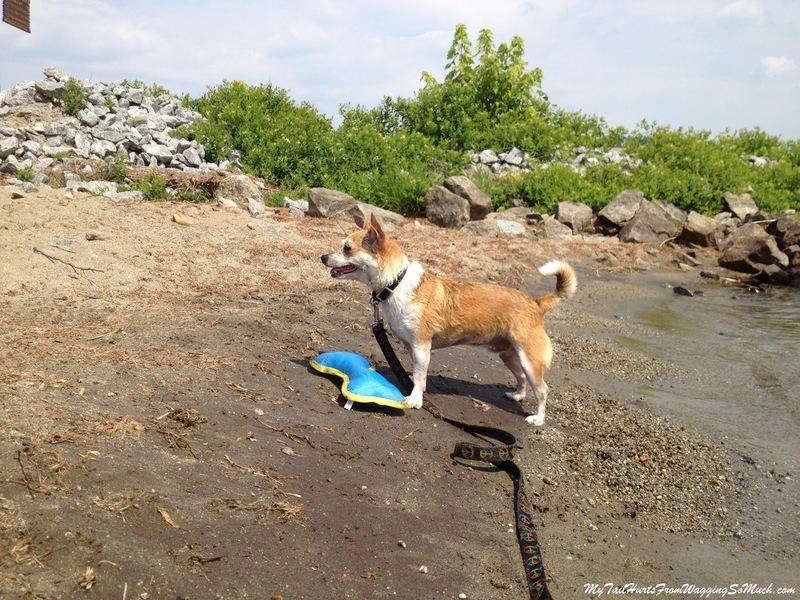 I brought him to the beach area where we were preparing to put in our kayaks and threw the toy into the water. He looked at it, and looked back at me. I fetched it and threw it again — all while getting real excited and trying to show him how fun it was. Well, after the third time of this, Toby ran right after it. I was shocked. Stunned. Amazed. He actually went in the water, and seemed to enjoy it! I mean, just how adorable?! When he didn’t think about it, he would run right in after it, but (just like me) when he got to the point where he couldn’t touch the bottom, he did begin to freak out a little, and would pause. Depending on how far out the toy was, he would swim a little to get it, but a majority of the time, I was in the water grabbing it. I’m in no way complaining, because after four years of trying to get him to play like this, he finally tried it! 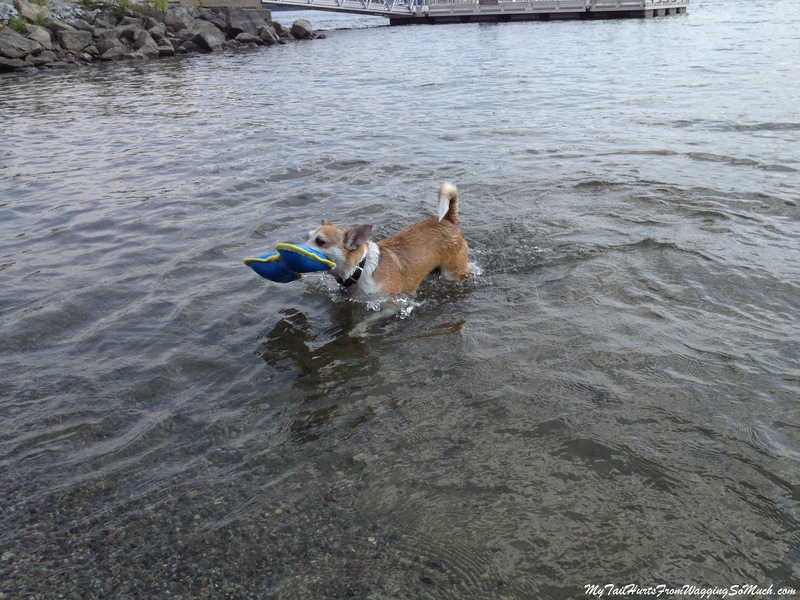 Does your dog like to play in the water? Hey,,,it's a start. Good for Toby ! Joke Puppy will avoid water at all costs,,,hates bath time,,,and doesn't even like getting hosed down on the several 100+ degree days we've been having. Well done Toby, water is such good fun although I don't like getting my ears wet. Have a happy Saturday and pop by and say hello sometime. So glad you put up the full post. I'm an definitely inspired. You'd think my Golden Retriever Honey would love the water. And she just enjoy playing in the shallows. 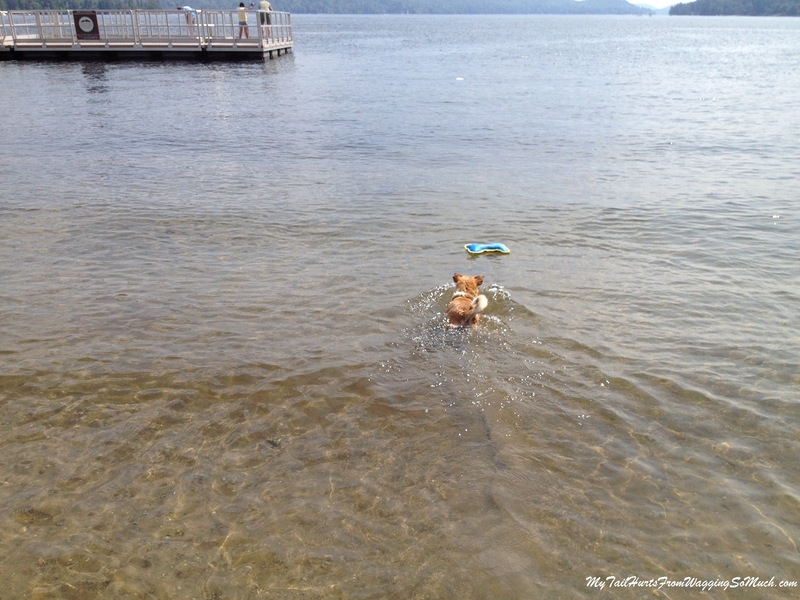 But I've never convinced her to swim–even to retrieve her favorite toy. And even with other dogs, and us in the water, and all the other things you mentioned trying with Toby. Honey is only 2 1/2 years old. So, if you've been trying to get Toby to swim for 4 years, I guess I just need to be patient. On the other hand, since we're looking to move onto a sailboat, I should probably be grateful she's not the kind of swim-crazy dog who would jump into the ocean in a heartbeat. Hey Toby, Jet here. Hi Miss Michelle. now he will wonder why he didn't try it sooner! Yay for Toby! Not only is water good for cooling off your furs, it has the added benefit of providing a great way to exercise. Of course, you KNOW what I think about water…..
Jasmine is a water maniac. If there is water, be it a lake, creek, or just a puddle, she's got to be in it. There is this one trail we sometimes go for walks where there can be probably a hundred puddles. You can count them easily without looking, just counting the splashing. Jasmine won't miss a single one. I like the really cool $5 toy too. That is a really good price. Brilliant, so there's hope yet for Renae? I LOVE outdoor swimming and in the UK that's not a popular past time, you know with all the cold and rain, even in our summer! And my dearest wish is to get my girls swimming with me. So far, Susie-Belle has tried it, in France in June, and I'm hoping she'll repeat it when we get back there later in the week for August. Renae hates it though. Love the photos, so sweet when they enjoy water. This brought a HUGE smile to my face! And those photos are so adorable. Yay for Toby!! And I happen to have a Lab that HATES the water. To this day nothing will coax her IN it or NEAR it. Now what's up with that? Someone forgot to tell her, "Hey you, you're a Lab. Lab's love water." Very beautiful, awesome and lovely photos. Aww that is an adorable picture! I'm glad Toby could cool off and enjoy the water a bit. Since you live so close to such great lakes and rivers, it would be nice for him. Looks like he had a good time. I especially like the last one, he looks so proud of himself for bringing the toy back!